Island Home and Garden is now carrying the creations of Beth Allison Gripenstraw, a talented Santa Cruz artist who uses different media to produce bright, whimsical merchandise. 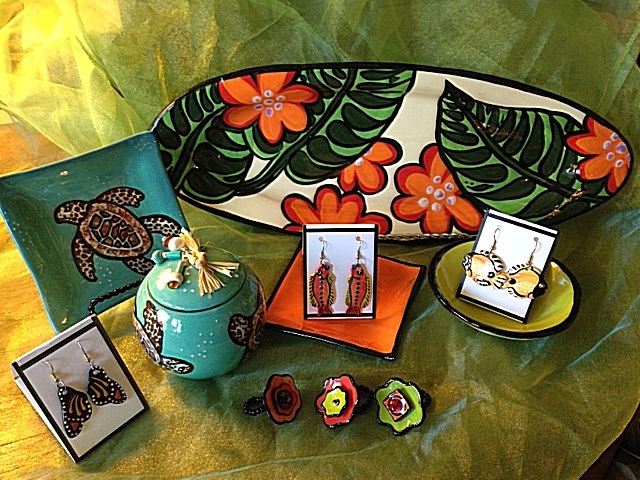 We have a selection of ceramic earrings – mainly tropical fish – in brightly glazed colors (all different) and tableware. The ‘treasure jars’ and platters feature turtles and tropical flowers, again glazed with Beth’s signature vivid colors. Her newest line of ceramics are sea urchins with detailed markings in pastel hues. We are pleased to be the first store in Santa Cruz to carry her latest design! Barb and Robyn wish all their customers the happiest New Year and the very best in 2014.